In an interesting new launch, Chinese electronics firm Xiaomi has introduced a new e-commerce platform called ShareSave. 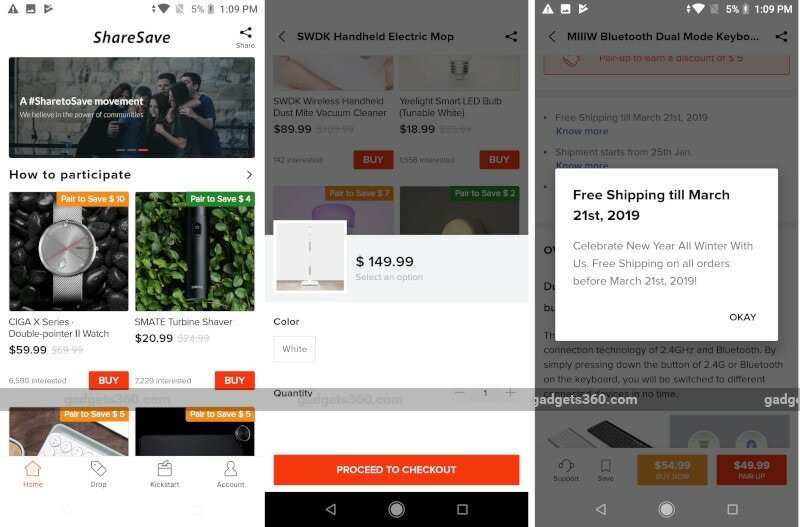 Limited to India right now, Xiaomi ShareSave aims to offers a quick and efficient way to order Xiaomi-ecosystem products that have not been released outside China. The company is using social e-commerce as the core model for the platform, which will allow the users to make outright purchases or pair their orders with friends and family to get discounts. The ShareSave is only available as an Android application on Google Play right now. There is no word if the company plans to release an iOS version of the app or launch a Web version. According to a post on Xiaomi's official blog, the company is hoping to provide its fans with a convenient and affordable way to order Mi ecosystem devices that have just been released in China with the Xiaomi ShareSave. It is a global initiative with India being the launch market. The company has plans to expand it to other markets in the future. “Xiaomi strongly believes in the power of communities and Mi Fans, and the social aspect of ShareSave is a perfect reflection of this. ShareSave allows for a place where Mi Fans connect, enjoy and share a unique #SharetoSave shopping experience. It also serves as a testing ground for key markets, allowing Xiaomi to learn more about the local demand for various types of product,” the company wrote in the blog post. Xiaomi notes that there are three purchase modes available on Sharesave – Pair-up, Drop, Kickstart. With Pair-up, as the name suggests, you can get a friend or family member to buy the product with you and you both get a fixed discount. Drop, on the other hand, allows buyers to choose a product from a select list and then invite friends and family to that Drop. The more friends join in, the less the price becomes, when the product has reached the targeted price, you will either get it free or at 50 percent discount. The third mode “Kickstart” let the buyers back the desired products for as low as $0.2 initial payment and when the product has been successfully funded, they will get ten-times the reward of that initial funding amount in the form of a shopping voucher. Apart from all these modes, the consumers also have the option to make outright purchases at the listed price. The company says it has partnered with 100 IoT and lifestyle companies for ShareSave, a number of which belong to its incubation platform. Some of the currently available products on Xiaomi ShareSave are Mi x Wiha Precision Screwdriver, Yeelight LED Light Bulb (Color), and Soocas Sonic Electric Toothbrush X1 Lite. The company promises to provide full local support for all the products purchased through the platform and a doorstep delivery. As we mentioned earlier, Xiaomi ShareSave is only available as an Android app right now. You can head over to Google Play to download the official app.